It's that time of year again - and everyone's rushing out to grab a great last-minute holiday deal. If you're exhibiting any of these symptoms, you definitely need a holiday. Looking for free things to do in London? We've put together 15 of the best London activities that won't break the budget. Are you suffering with a case of wanderlust? Check out our 9 signs that you're addicted to travel. The all-around best beaches in Cornwall. If you want to know where to find the best beaches in Cornwall, there's never a bad time for a life-affirming trip to its glorious coastline. We defy you not to be filled with joy! There are hundreds of award-winning beaches in the clotted cream county and everyone has their own favourite, whether it's for a spot of paddling, crabbing, rambling or surfing. Cornwall has long been on our list of favourite UK staycation destinations and we think the region's sands rival the best beaches in Europe. If you want to explore one of the UK's top destinations, you'll want to read on for our round-up of 10 of the best beaches in Cornwall. Most have parking, toilets and lifeguard patrols during peak seasons, and the majority operate a seasonal dog ban, but check the signs. All have excellent water quality. These are the best beaches in Cornwall. Owned and managed by the National Trust, with a popular tea shack offering tasty treats throughout the year, spectacular Chapel Porth near St Agnes on Cornwall's rugged north Atlantic coast is a seriously dramatic spot. Walkers relish the surrounding heathland, native wildlife and intriguing remains of the region's tin mining industry, including the iconic Wheal Coates ruin. It's also a great surfing destination and has been home to the very British World Bellyboard Championships since their inception in the 1920s. Easily one of Cornwall's best beaches. Sprawling Porthtowan is accessible from Chapel Porth when the tide's out. One of the county's most popular surfing beaches, there are big waves, stunning golden sands, rolling dunes and breathtaking cliffs. What more could you want? You'll also find rock pools and a children's playground at one end of the beach for intrepid little foragers and the Blue Bar for some laid-back refreshment. A few miles from hectic Newquay, this glorious bay offers two miles of golden sands, a reliable Atlantic swell and stunning cliffside backdrop, along with the cool beachside Watergate Bay Hotel, Jamie Oliver's Fifteen and a few smaller, more informal beach eateries. The bay is well-known for hosting sporting events around the year including the English National Surfing Championships, Sandball and Polo on the Beach. Less wild but just as beautiful in its own way is family favourite Porthminster Beach, close to the centre of St Ives. A golden crescent of pristine sand fringed by swaying palms; safe, clear waters; deck chairs and mini golf, the award-winning Porthminster Beach Cafe and fantastic views of the Godrevy Lighthouse all add up to British seaside heaven. Nestled not far from the most westerly point of Cornwall and the UK itself (Land's End), this picturesque bay is a haven for surfers, twitchers and other wildlife fans. Visitors love the atmospheric, fishing village community with a relaxed surf vibe and its small collection of independent surf shops, pubs, cafes and galleries. After a visit to Sennen Cove, you'll understand why Cornwall is frequently hailed as one of the world's most relaxing destinations. Here we have a large sand and shingle beach in another gorgeous Atlantic setting, a few miles from Redruth. Loved by families, bodyboarders and surfers, facilities include a couple of cafes, surf shops, pubs and an amusement arcade to keep the troops entertained when they've tired of the sea, sand and rockpooling. For a real taste of the wild, explore this rugged, little-known spot on the south eastern Cornish coast for some excellent swimming, snorkelling and diving. Unlike most of the other beaches on this list, there are no toilets or other facilities and you'll need to be prepared for a long, uneven walk down to the sand and shingle beach. Once there, enjoy the spectacular views, coastal wildflowers, seabirds, cliffs and rocks, stream and even a waterfall. We have absolutely no doubt that this coastal paradise right at the bottom of the county is one of the best beaches in Cornwall. Think fine soft white sands, azure seas, towering cliffs, and a stream running down one side, perfect for little ones to paddle. When you fancy a wander, there's the quirky outdoor Minack Theatre perched high up on the cliffs, nearby Porthcurno Telegraph Museum, and Logan Rock around the bay. They keep on coming! Treyarnon Bay is a small sandy cove close to Padstow in North Cornwall. Its sand dunes, nooks, crannies and rocks make it a favourite destination for family paddling and rockpooling. It's also a hotspot for surfers at mid to high tide. An all-round crowd-pleaser, Gwithian is a big blustery sandy beach backed by dunes on the Atlantic coast of Cornwall. Families, surfers and nature-lovers are all catered for here, with consistent waves to suit all; rock pools and caves revealed at low tide; and a wealth of wildlife including common seals and seabirds such as guillemots, cormorants and razorbills. The beachside cafe and bar keep visitors refreshed all year round. 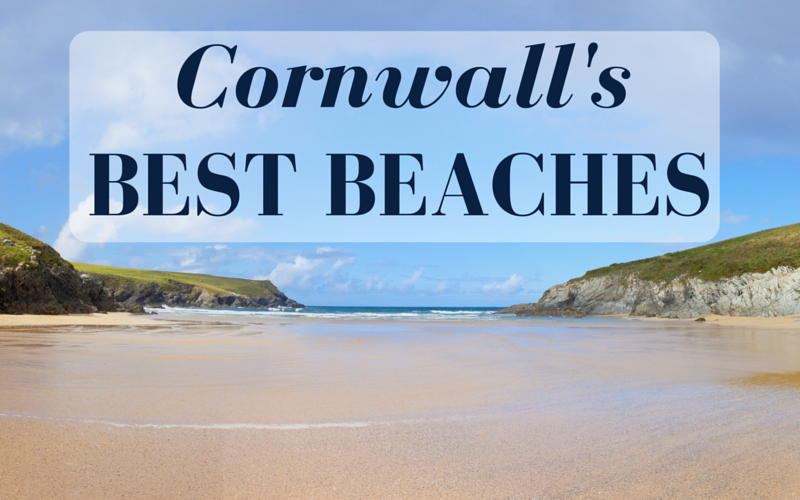 Did we miss one of your favourite beaches in Cornwall? Let us know in the comments below! If you found this post on the best beaches in Cornwall helpful, you may want to read more of our Wanderlust articles. Also check out our travel blog for additional inspiration and travel tips to make your holidays hassle-free!